The Bora Speedhorse from Portamate looks like a great option out of the box, but our Pros had a few questions before signing off on them. With plenty of cheap plastic options out there along with the option to just make your own, we’ll see if the PM-4500 is worth a look. The team responsible for the Bora Speedhorse clearly put some real thought into the design and there’s a lot to like. If you’re picky about your sawhorses, take a look at a hands-on demo to see if that little bit of wobble is going to be an issue for you. Aside from that, this is one of the easiest folding leg sawhorses we’ve used and it’s significantly better built than the cheap plastic ones running around. Each Bora Speedhorse can hold up to 1500 pounds or 3000 for a pair. We didn’t need to hold anything near that kind of weight, but we do use a sheet of plywood or subfloor to make a surface for equipment and tools that can be several hundred pounds collectively. There are sandpaper sheets adhered to the left and right sides of each sawhorse to help material stay in place. It’s a nice touch, but we started wearing it away pretty quick. Setting that first sheet on top, the issue of a metal build presents itself – what about a sacrificial board? Look at the top and there are a couple of holes pre-drilled. These are to screw in a 2×4 across the surface. More intelligent design comes into play here. When you set a pair of 2x4s into the slots (they fit vertically), you create a flush surface with the sacrificial 2×4 and the perfect frame for your table sheet. If you’ve ever tried to put much weight on a plywood table set directly on two sawhorses, it sags in a hurry. Creating this quick frame lets you take advantage of the high load capacity. 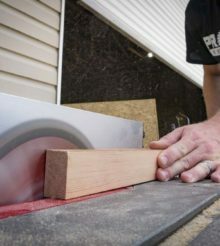 At 45″ wide, you get a much wider base than most of the cheap, plastic sawhorses you can pick up and it’s even a couple of inches wider than DeWalt’s design. That’s helpful in building a stable plywood table all the way to the edges. One thing we noticed is that there’s some side-to-side wobble in the legs when they’re set up. It’s not extreme by any means, but it might cause additional wear in those parts over time. On the positive side, flip-outs give you a place to set your material off the ground. The Bora Speedhorse is named for its quick setup and takedown. Once you get where you want to work, setup and takedown really are simple. Hold the Speedhorse up and hit the release under the handle – the first set of legs will flip down and lock in place. Hit the release for the other legs and you’re in business. When you’re ready to bring them back, unlock the legs by pulling up on the lever on either outside edge. Once you bring the legs up, they’ll lock themselves in place. It doesn’t matter which legs you deploy or collapse first. Carry slots in the sides give you a handle to work with, but these don’t stack and lock like DeWalt’s Metal Folding Sawhorses. When you’re carrying one in each hand, it’s not too bad since you’re balanced. At 17.9 pounds each, the weight is noticeable. You expect to pay more for metal sawhorses than plastic or wood. Each Bora Speedhorse is $74.99 and there’s a 5% discount if you buy two or more. When you look at the other options out there, it doesn’t seem like too much of a premium. But we can’t get away from the comparisons to DeWalt’s design that runs $40 each or $70 for a pair. Just keep in mind that DeWalt uses some substantial amounts of plastic around their metal frame and legs. That said, there are a lot of sawhorse varieties out there and while $75 is on the premium side, it’s not way out in left field. *Pricing and discount as of late February, 2019. @ $35/ each, I’m willing to sacrifice a couple hundred pounds of load. 160 for a pair !! I had a hard time spending 80 for my current sawhorses that are the same style just dont have the colapable legs .you will save time breaking them down which saves you MONEY in the long run .just gonna be a hard sell to the old timers….